My Old Kentucky Dinner Train is an upscale attraction based in Bardstown, Kentucky and hosted by short line conglomerate RJ Corman Railroad Group. The dinner train covers a distance of just over 18 miles between Bardstown and Limestone Springs Junction, Kentucky (37-mile round trip) as it winds its way along a former Louisville & Nashville branch line. Trips normally range in length from 2.5 to 3 hours. 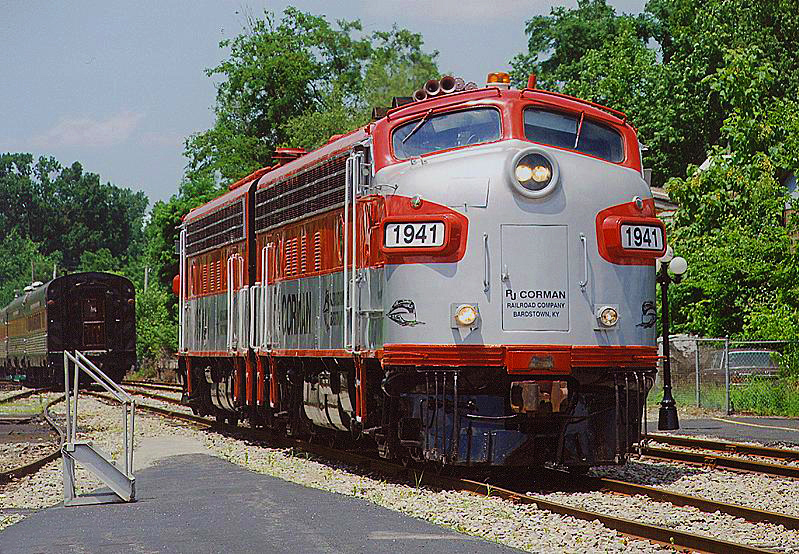 The My Old Kentucky Dinner Train was started in the late 1980's to complement Rick Corman's first railroad, today known as the Bardstown Line. 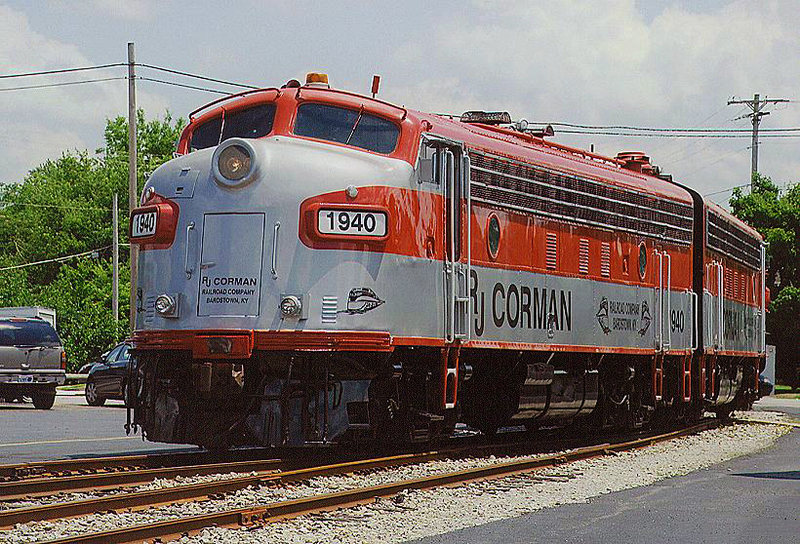 Since its inception, the train has become quite popular thanks to Corman's vision of providing top notch service. Unlike many excursions, the My Old Kentucky Dinner Train operates year-round although their lunch/dinner menu change depending upon the season. As a formal setting please be aware the railroad asks patrons to dress appropriately! Their web page provides all the details regarding attire requirements. Without the vision of Rick Corman there would be no RJ Corman Railroad Group. Today, it is one of the top short line conglomerates in operation although, ironically, did not directly begin in the railroad industry hauling freight. In the June, 2007 issue of Trains Magazine under a piece entitled, "Who Is R.J. Corman? And Why Is His Name On The Side Of These Locomotives?," Bob Withers offered an in-depth look at this unique company. Mr. Corman was a self-made man who launched his business in 1973 while still in high school. Using nothing more than a rented backhoe and his pickup truck he believed there was great demand in cleaning up derailments. While he struggled for many years the concept would eventually prove successful for two reasons: firstly, his company was launched during the industry's darkest era when track conditions were generally wretched and derailments frequent; and secondly, he befriended Luther Deaton, Jr., then a young officer of commercial lending at Central Bank & Trust in Lexington, Kentucky. The two struck-up a quick friendship thanks to a related interest in railroading and the loans Corman received, in addition to the bank's patience and belief in his endeavor, provided him the time to build a multi-million dollar empire. Corman would establish his headquarters in Nicholasville, Kentucky which today has expanded to a 1,500-acre site. The company has branched out into fields far beyond derailment/cleanup services. These include material sales (providing hardware for railroads), industrial switching, distribution centers, new railroad construction, industrial vacuum services, rental equipment, and even aviation services. 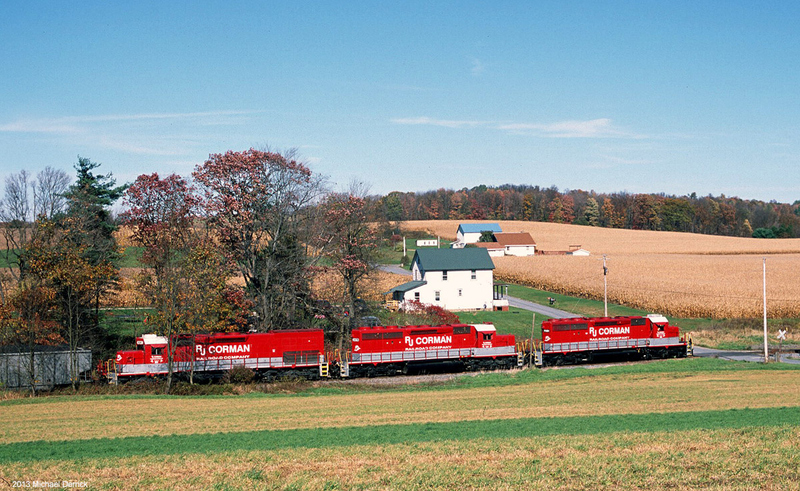 Corman became directly involved in railroading during the 1980's thanks to then Seaboard System president and chief executive officer, Richard D. Sanborn, Jr. who was impressed with his derailment services. Sanborn wanted to spin-off a former Louisville & Nashville branch which ran from Bardstown Junction, Kentucky (along the ex-L&N Louisville-Nashville main line) to Bardstown. The corridor had originally been built as the Bardstown & Louisville Railroad in 1860 and once ran as far as Hill, Kentucky. It was acquired by the L&N in 1864. 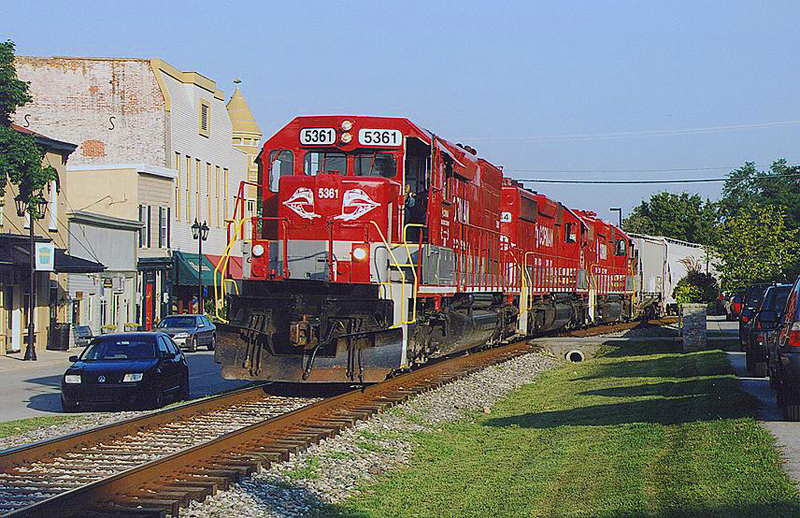 The 20-mile "Bardstown Line" began freight operations in January, 1987. The following year it was complemented by a tourist attraction, the My Old Kentucky Dinner Train. Mr. Rick Corman was your storybook entrepreneur, believing in hard work and doing whatever was required to create a successful business. A few years prior to his passing he was featured in Fortune Magazine's March, 2011 issue. At that time his efforts had produced a company boasting $300 million in annual revenue, $50 million in annual profits, and a net worth well into the millions. 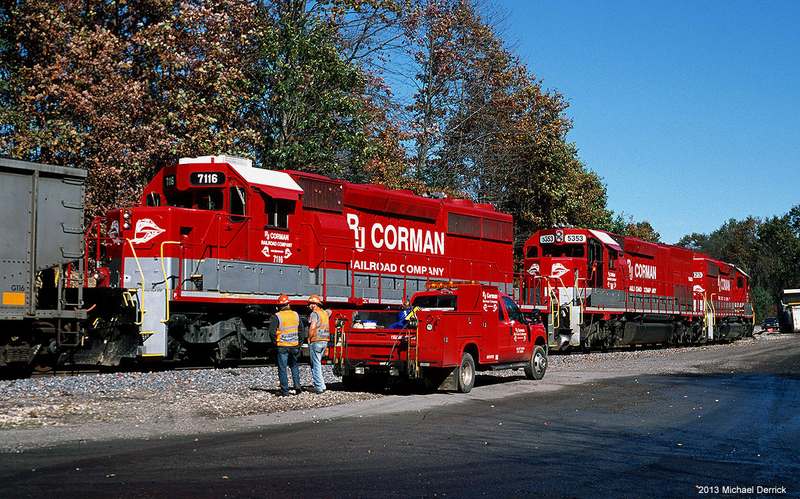 Today, RJ Corman, whose famous "Corman Red" paint scheme (the color of his first pickup truck) adorns everything from locomotives to helicopters, employs more than 700. For all of his accomplishments, Corman was a very approachable and personable individual although he demanded the same work ethic from his employees as he did himself. Holding true to his philosophies the company's future appears bright in his absence. Instead of simply hosting train rides and hoping to attract a few curious riders, Mr. Corman had a vision with the My Old Kentucky Dinner Train. Despite its relatively obscure location, as James D. Porterfield notes in his book, "From the Dining Car: The Recipes and Stories Behind Today's Greatest Rail Dining Experiences," Corman believed an upscale service providing fine dining on-board with evening departures would prove successful. It turns out he was right as the train has been in continuous operation now for more than 30 years. For power the train utilizes a pair of former Southern Railway FP7 streamlined diesel locomotives. In spite of its immediate obscure location the train is not far from several populate regions such as Louisville (40+ miles), Lexington (60 miles) and Fort Knox (40 miles). If you’re a planning a trip on the My Old Kentucky Dinner Train prices vary depending on the train. A standard lunch is less expensive than an evening dinner, which runs more than $80 a plate for an adult. While the prices may seem high the train has become quite famous for its food an dining experience, so you shouldn’t be disappointed with the experience. Few tourist railroads require a dress code although the My Old Kentucky Dinner Train is not your typical such attraction. As a formal venue they request customers be dignified and well dressed. According to the railroad: "My Old Kentucky Dinner Train requires dressy casual attire. For women, reasonable length skirts/dresses, full length trousers or nice denim jeans combined with a dress shirt, polo or sweater set are acceptable. For men, collared dress shirts, golf polo’s or sweaters paired with dress slacks, khakis, nice denim jeans or nice dress shorts are acceptable. My Old Kentucky Dinner Train adheres to these standards, and we ask that you please come appropriately dressed for our fine dining excursions." The train boards from the restored Louisville & Nashville freight depot in Bardstown that dates to 1860 (the building's passenger section was removed in 1953 after the L&N stopped service over the branch). Today, the railroad has spent much money and effort to improve the boarding location by paving the track approaches for easier train access. Additionally, they have installed attractive outdoor lighting so folks can easily see when exiting and entering. At one time, RJ Corman even entered steam locomotive preservation when it acquired a former Chinese locomotive, Class QJ 2-10-2 #7040 which arrived in New Orleans on December 24, 2007. Nicknamed "Old Smokey" it made its inaugural run on May 24, 2008 hauling the "Sand Special" which consisted of six new gondolas of sand and a caboose. The locomotive, based in Lexington, is relatively new having been built only in 1986 by Datong Locomotive Works for use on China's Ji-Tong Railway. RJ Corman utilizes a pair of history FP7 locomotives for its My Old Kentucky Dinner Train attraction. These diesels began their careers on the Southern Railway. After Corman's acquisition it enjoyed a series of special runs over the 118-mile Central Kentucky Lines, another former L&N route connecting Winchester and Anchorage. Some thought perhaps it would eventually be used on the My Old Kentucky Dinner Train thanks to a steam locomotive's natural public appeal. However, the big 2-10-2 wound up playing a relatively minor role in the Corman empire. Then, Rick Corman passed away on August 23, 2013 at the age of 58 after a long battle with multiple myeloma (a rare type of blood cancer), first discovered in 2001. While the future of the big steamer remains in doubt and will likely leave the Corman fold at some point, the dinner train will certainly continue to remain an important (albeit minor) aspect of the company. To learn more about experiencing the My Old Kentucky Dinner Train please click here to visit their web page at RJ Corman's official website. Here, they provide everything you need to know regarding riding the train including pricing, directions, the correct attire, lodging, special events, and much more.